CLEARWATER- The tbnweekly.com writes that a motorcyclist was severely injured in a crash on January 30, 2019, at about 8:55 in the evening. The police reports indicate that the motorcyclist, 21-year-old Ryan Decubellis of Port Richey was heading north on his 2017 Suzuki Motorcycle on U. S. 19 North with four others on motorcycles. Decubellis rode past two Pinellas deputies at a high rate of speed and was accelerating. A 2003 Kia Optima was about to turn left onto Winding Creek Boulevard from U.S. 19. Decubellis collided with the front of the turning Kia. The crash caused Decubellis to be ejected from his vehicle and to suffer serious injuries. Decubellis had a helmet on at the time of the accident. The driver of the Kia, 54-year-old Scott Colletti, was also injured in the crash and was taken to the Mease Countryside Hospital. The investigators stated that the incident occurred too quickly for the deputies on the scene to initiate a stop of the motorcycle or to activate their lights. Decubellis is facing charges in connection to the crash. Police say that speed was a factor in the collision. Speed is a leading factor in many severe crashes. When a driver is traveling at a high rate of speed, they have less time to react to emergency situations on the road. If a crash does occur when a vehicle is speeding, the resulting injuries are more likely to be severe. Motorcycles are often involved in crashes with vehicles that are making left turns because drivers turning left often fail to notice motorcycles due to their smaller size. 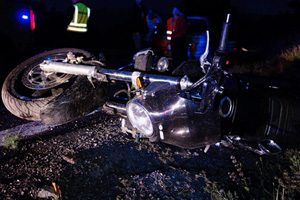 It is important for drivers and motorcyclists to be aware of the risks in this situation.